- Publisher From the Heart takes sixty Bible stories and converts them into exciting vignettes. Each story is loaded with dialogue and placed in a contemporary framework. Heartfelt applications following each story add insight with a personal flair. Carolyn brings zest, meaning, and new understanding to many of our favorite Bible stories. 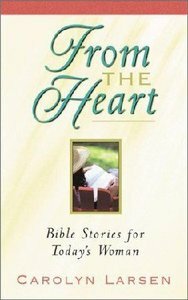 From the Heart takes sixty Bible stories and converts them into exciting vignettes. Each story is loaded with dialogue and placed in a contemporary framework. Heartfelt applications following each story add insight with a personal flair. Carolyn brings zest, meaning, and new understanding to many of our favorite Bible stories.